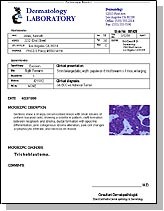 Loma Linda Dermatopathology | Pathology diagnoses you can use! Pathology diagnoses you can use! Welcome to the website of Loma Linda Dermatopathology. We provide full-service dermatopathology consultations to physicians across Southern California. Our courier service picks up skin specimens directly from the physician’s office and then delivers pathology reports within five-to-ten business days. We provide pathology consultation services to physicians in counties including San Bernardino, Los Angeles, Riverside, and Orange County. Our board-certified dermatopathologist, Fred F. Soeprono, M.D., has been providing Southern California with dermatopathology and dermatology services since 1986. Dr. Soeprono teaches dermatopathology and dermatology at the Loma Linda University School of Medicine and lectures at the University of California, Riverside, School of Medicine. He was trained in dermatopathology by A. Bernard Ackerman at the New York University School of Medicine. Our pathologist is available by telephone for the referring physician’s questions regarding the consultation. We can bill most patient’s insurance payers for the technical and professional components of the consultation. Our friendly staff help explain the insurance billing process to the patients. Please contact Shawna at (909) 796-2211 to discuss your dermatopathology needs. This site is Copyright 2011, Soeprono Medical Corporation, a California Professional Corporation. All rights Reserved.